Lazio sacked coach Stefano Pioli after a comprehensive 4-1 defeat to second-placed Roma in the Rome derby. Thousands of fans boycotted the match at the Stadio Olimpico over increased security measures as Roma extended their unbeaten league run to 10 games. 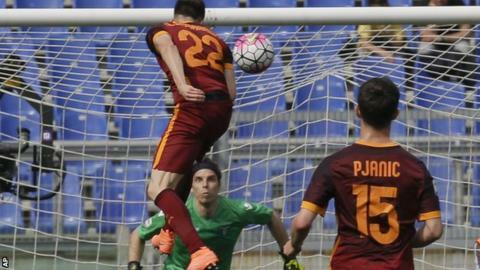 Stephan El Shaarawy headed Roma in front with Edin Dzeko making it 2-0. Lazio got one back through Marco Parolo but Roma struck late through Alessandro Florenzi and Diego Perotti before Lazio defender Wesley Hoedt was sent off. Roma tightened their grip on a Champions League qualification place and closed the gap on second-placed Lazio to four points as they completed the double over their biggest rivals. Lazio have now won just one of their last six league games to remain eighth in the table and on Sunday evening announced the departure of Pioli, 50, who had been in charge since July, 2015. Roma dominated the first half but went 2-0 up against the run of play when substitute Dzeko tapped in their second, 19 minutes after the break. Parolo's close-range finish gave Lazio hope of a fight-back but fine strikes from Florenzi and Perotti within the space of four minutes kept Roma's run going with Hoedt collecting a second yellow card for a rash challenge in stoppage time. Inter Milan suffered their first home defeat since mid-January after having two players sent off in a 2-1 loss to Torino. Roberto Mancini's side looked to be in control when they led at half time through a Mauro Icardi penalty. But Cristian Molinaro equalised before Miranda was sent off for a second yellow card after 57 minutes. Yuto Nagatomo was then harshly dismissed for tripping Andrea Belotti and conceding a controversial penalty, which Belotti converted 17 minutes from time as Torino won for the second time in 12 league games. Inter's chances of Champions League qualification now look remote but they remain five points clear of AC Milan in fifth place after Milan lost 2-1 at Atalanta. On-loan Liverpool striker Mario Balotelli came on as a second-half substitute for Milan but could not stop Atalanta winning for the second game in a row following a 14-match winless run. Match ends, Lazio 1, Roma 4. Second Half ends, Lazio 1, Roma 4. Attempt saved. Diego Perotti (Roma) right footed shot from outside the box is saved in the bottom left corner. Assisted by Miralem Pjanic. Second yellow card to Wesley Hoedt (Lazio) for a bad foul. Alessandro Florenzi (Roma) wins a free kick in the attacking half. Foul by Wesley Hoedt (Lazio). Iago Falque (Roma) wins a free kick on the left wing. Foul by Lucas Biglia (Lazio). Attempt blocked. Patric (Lazio) right footed shot from outside the box is blocked. Assisted by Keita. Miralem Pjanic (Roma) wins a free kick in the defensive half. Goal! Lazio 1, Roma 4. Diego Perotti (Roma) left footed shot from outside the box to the bottom left corner. Attempt blocked. Edin Dzeko (Roma) left footed shot from the centre of the box is blocked. Assisted by Iago Falque with a cross. Attempt missed. Marco Parolo (Lazio) header from the centre of the box is too high. Assisted by Lucas Biglia with a cross following a corner. Corner, Lazio. Conceded by Alessandro Florenzi. Substitution, Lazio. Filip Djordjevic replaces Danilo Cataldi. Goal! Lazio 1, Roma 3. Alessandro Florenzi (Roma) right footed shot from outside the box to the bottom left corner following a corner. Corner, Roma. Conceded by Milan Bisevac. Substitution, Roma. Ervin Zukanovic replaces Mohamed Salah. Foul by Miroslav Klose (Lazio). Offside, Roma. Seydou Keita tries a through ball, but Mohamed Salah is caught offside. Offside, Lazio. Felipe Anderson tries a through ball, but Miroslav Klose is caught offside. Attempt saved. Felipe Anderson (Lazio) right footed shot from very close range is saved in the bottom left corner. Assisted by Marco Parolo. Attempt missed. Marco Parolo (Lazio) header from very close range misses to the right. Assisted by Lucas Biglia with a cross following a corner. Corner, Lazio. Conceded by Seydou Keita. Goal! Lazio 1, Roma 2. Marco Parolo (Lazio) right footed shot from very close range to the centre of the goal. Assisted by Miroslav Klose. Attempt missed. Miroslav Klose (Lazio) header from a difficult angle on the right is close, but misses to the left. Assisted by Keita. Corner, Lazio. Conceded by Lucas Digne. Substitution, Roma. Iago Falque replaces Radja Nainggolan because of an injury. Danilo Cataldi (Lazio) is shown the yellow card. Attempt missed. Wesley Hoedt (Lazio) left footed shot from outside the box is too high. Assisted by Miroslav Klose. Attempt saved. Marco Parolo (Lazio) header from very close range is saved in the top centre of the goal. Assisted by Miroslav Klose with a headed pass. Attempt blocked. Felipe Anderson (Lazio) right footed shot from outside the box is blocked. Assisted by Lucas Biglia with a cross. Corner, Lazio. Conceded by Diego Perotti.